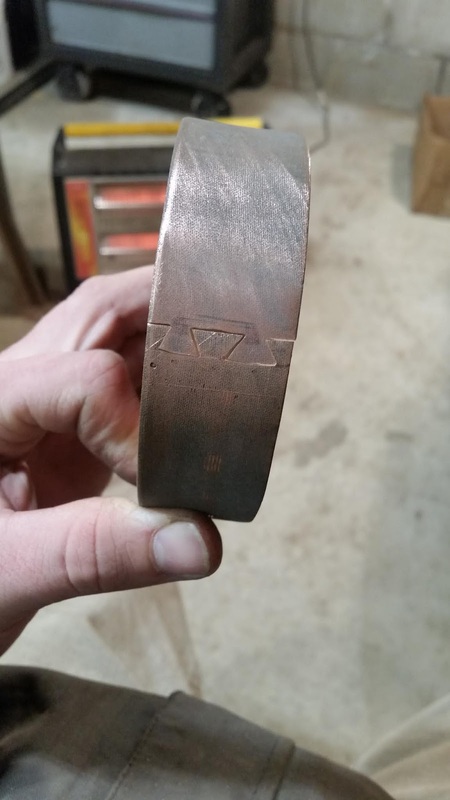 Finally delivered so I can share this. 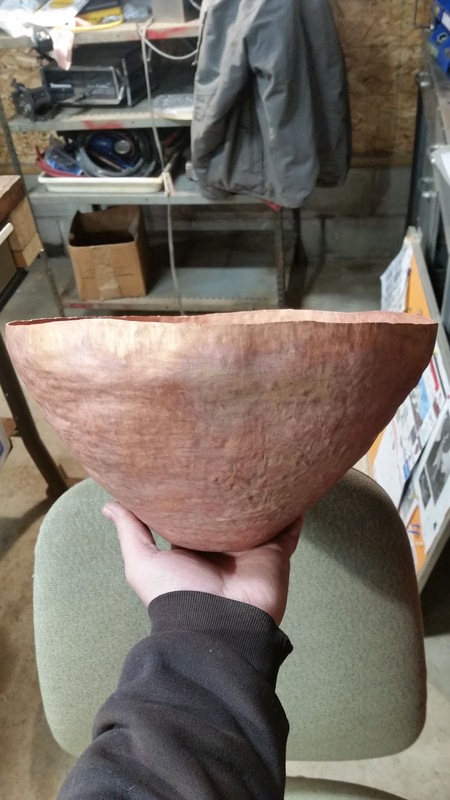 Work time on this piece was right about 100 hours. 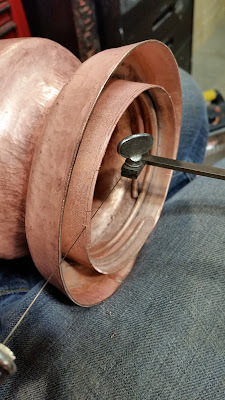 First time for: hand made threads, dovetail joining technique, hand engraving and using the jewellers saw with the flat blade sideways and cutting backwards. 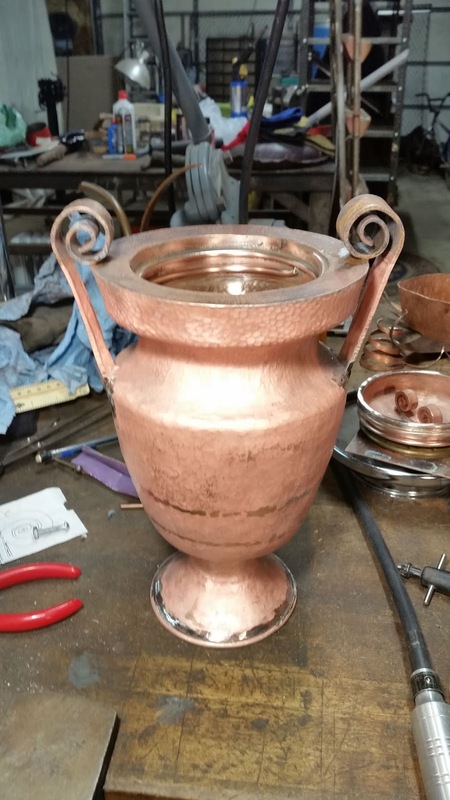 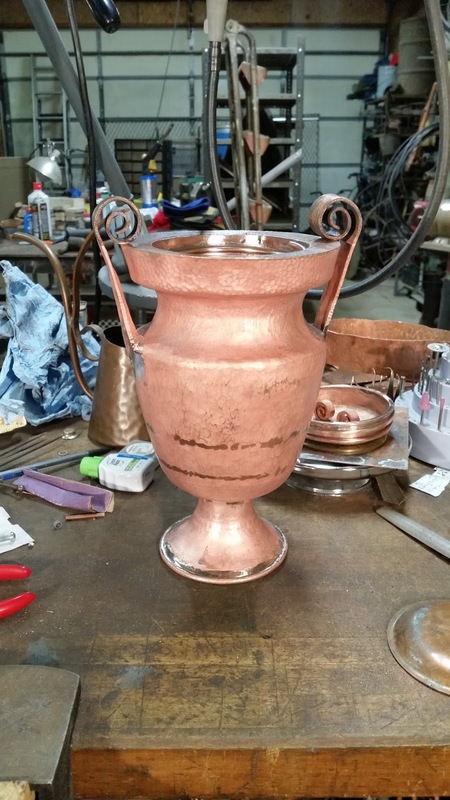 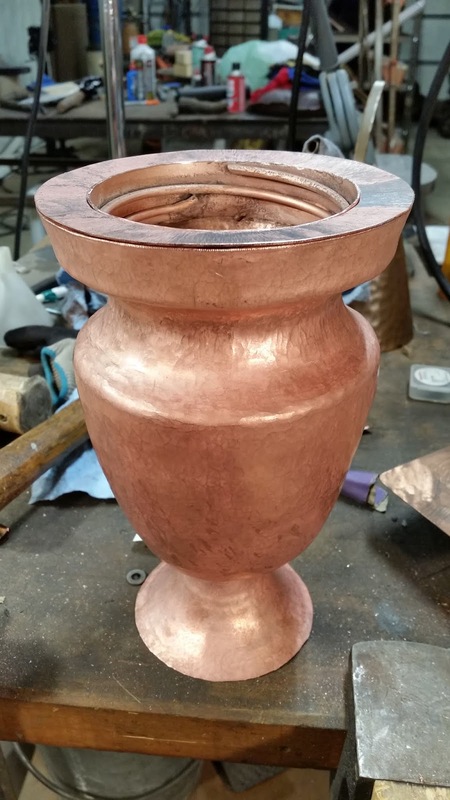 Funerary urn commission inspired by Greek volute krater urns. 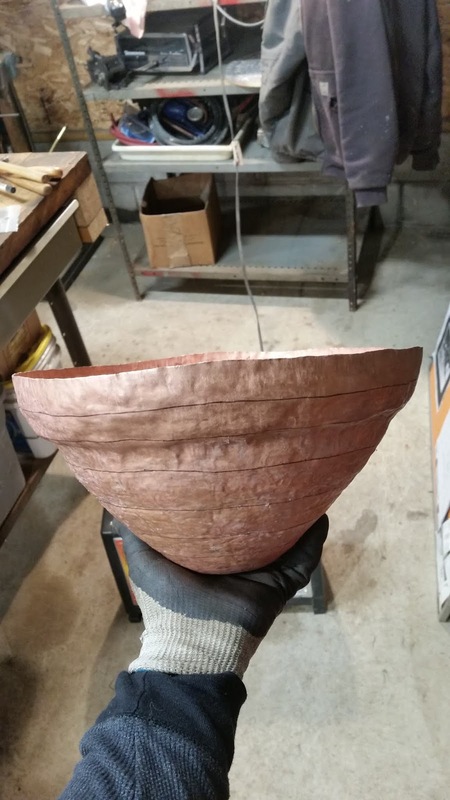 Raised from flat sheet copper by hand hammering.. One piece outer shell, foot, threaded collar and threaded cap with added trim rings and handles. 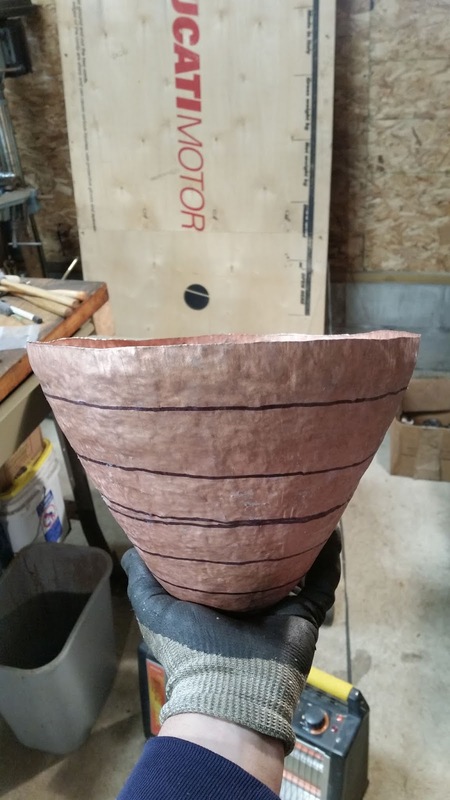 A very exciting piece to accomplish. 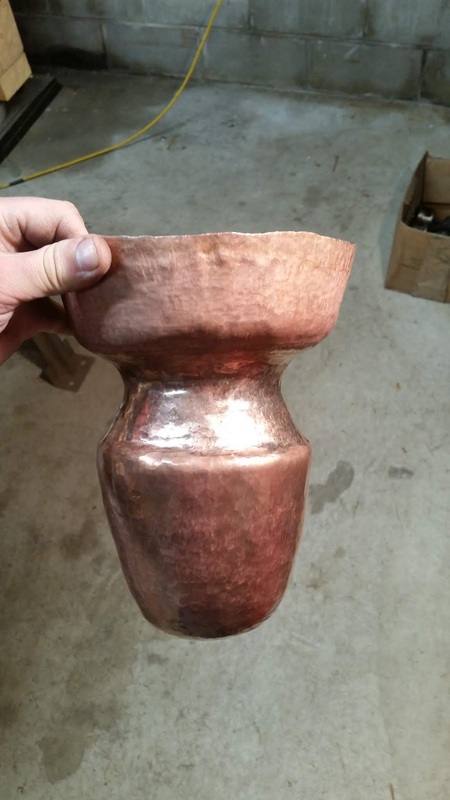 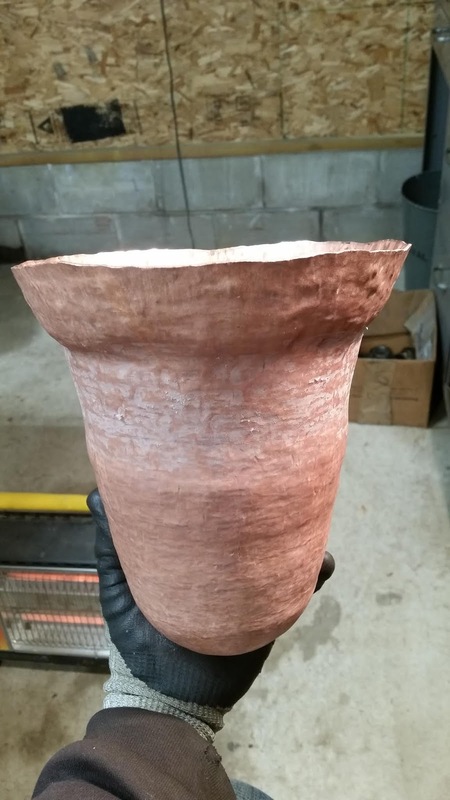 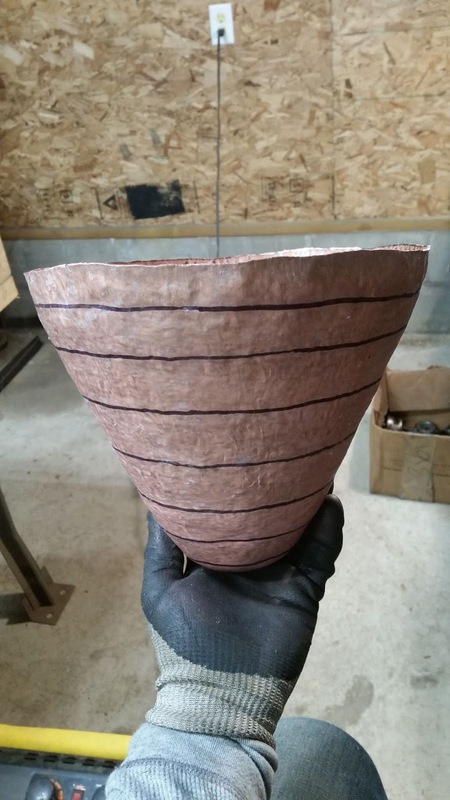 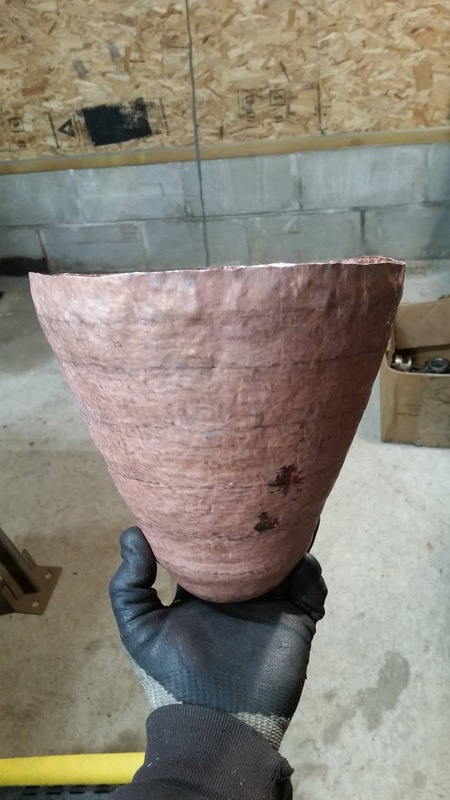 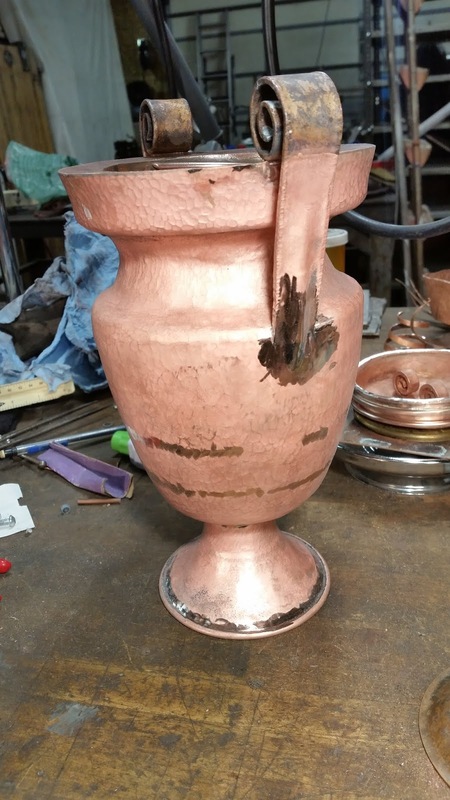 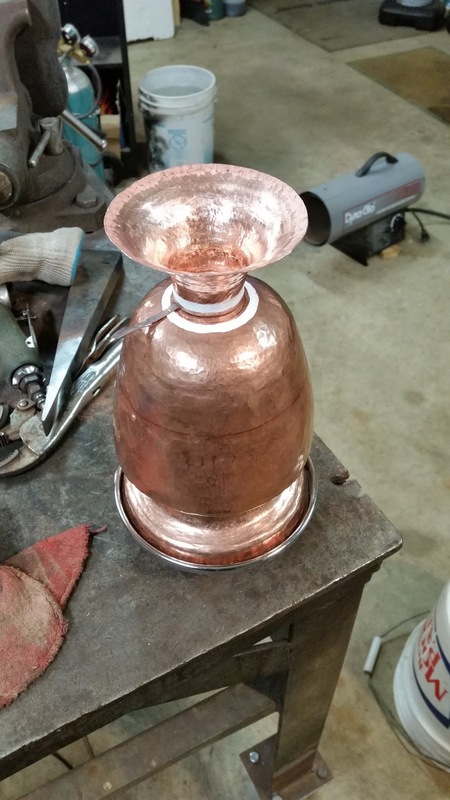 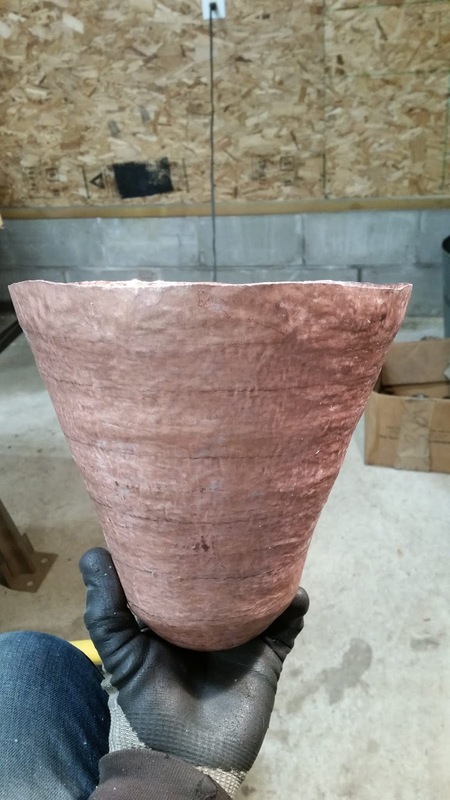 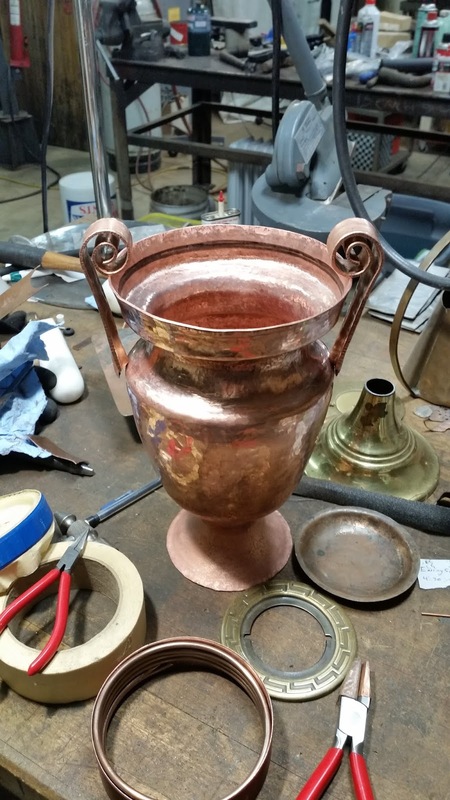 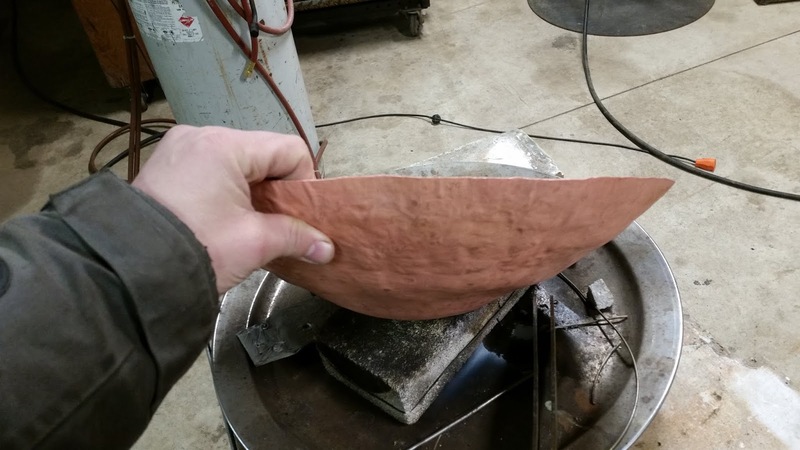 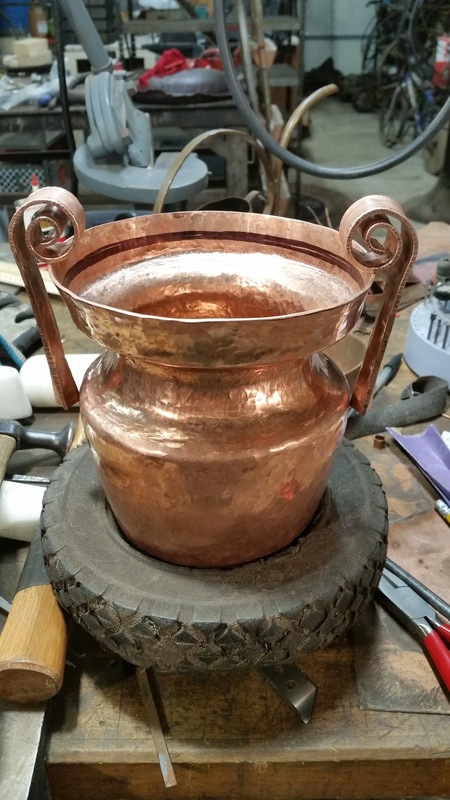 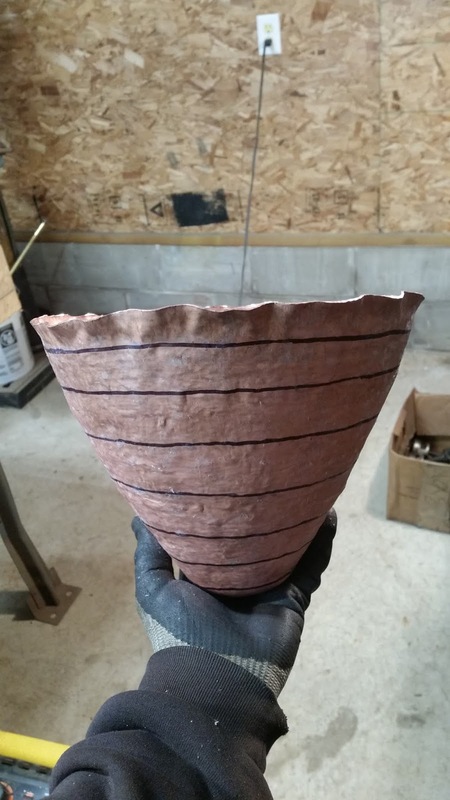 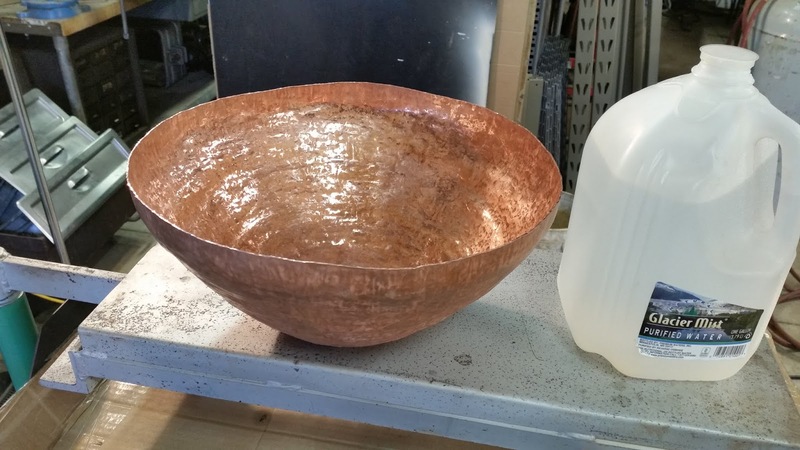 This post aims to show the general process of raising a vessel. 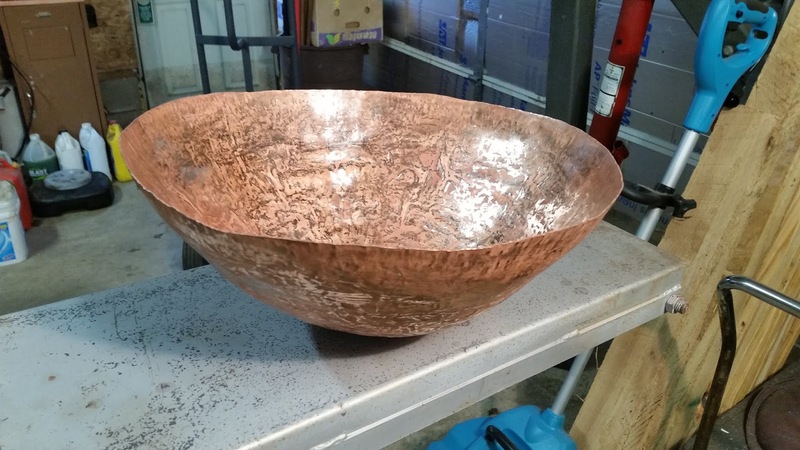 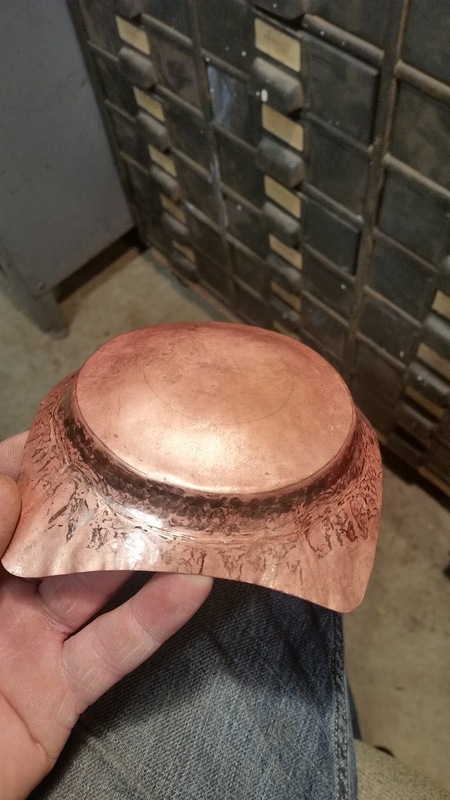 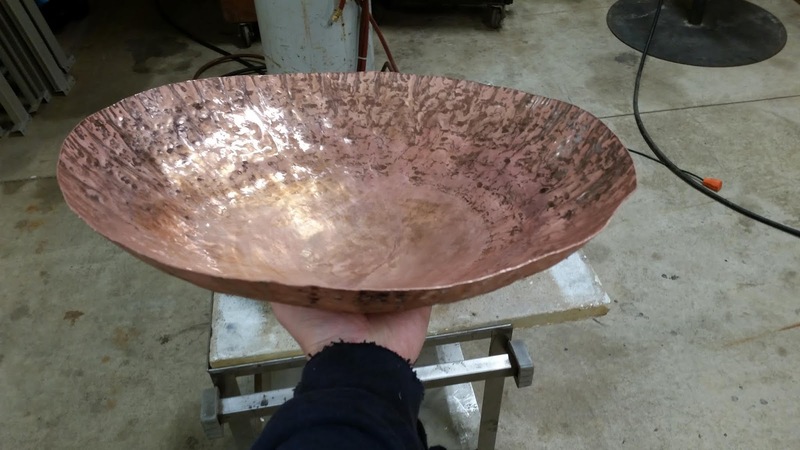 Pretty much every vessel I make is raised from reclaimed sheets of copper or brass , this one being an etched printing plate made of copper. 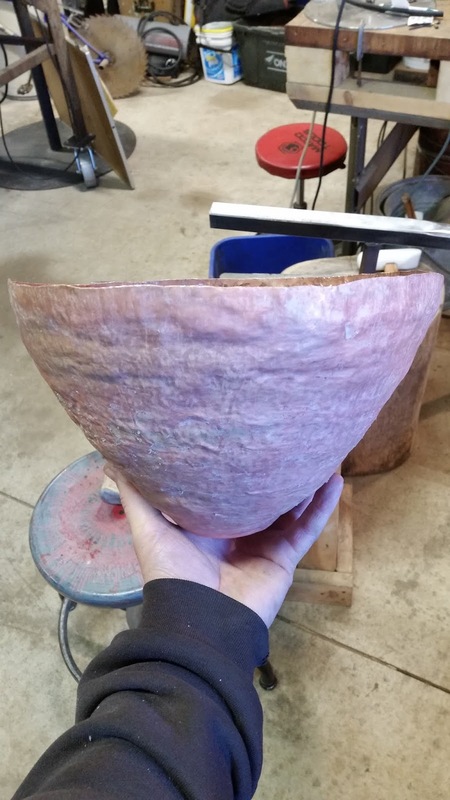 Most vessels I make are raised from a disc and so I cut the printing plate to the shape. 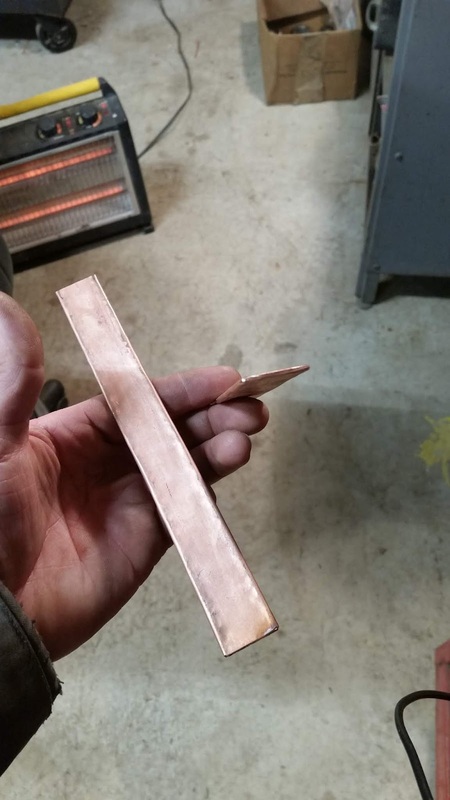 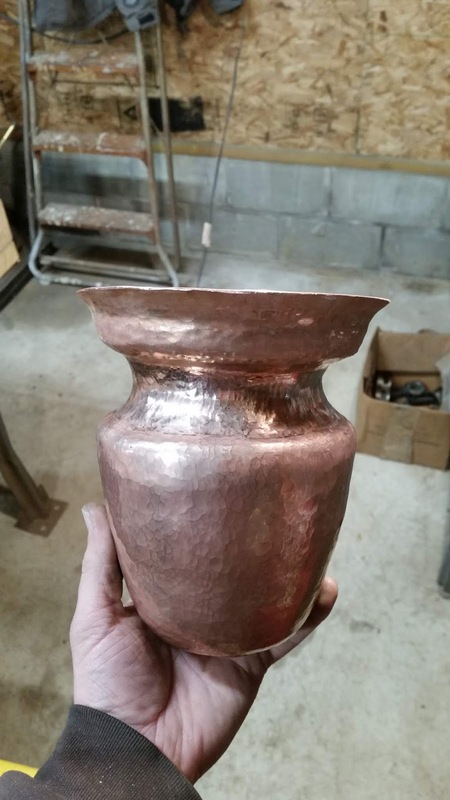 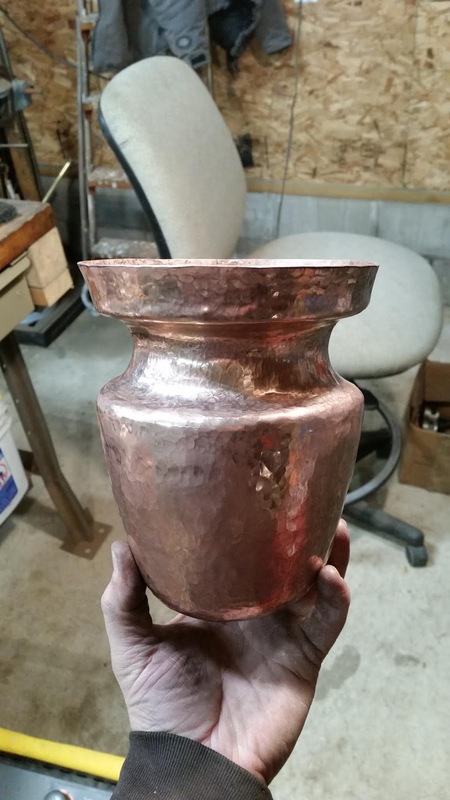 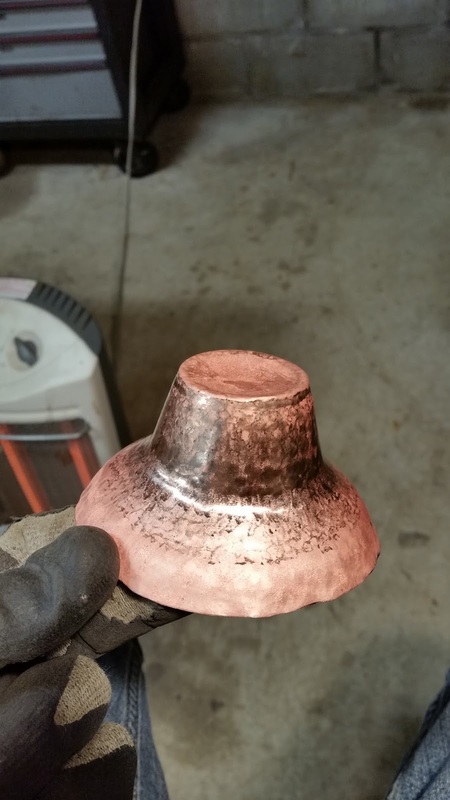 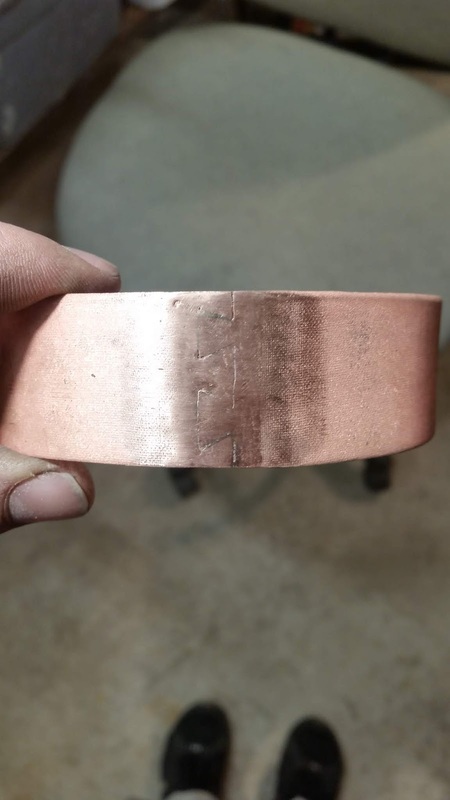 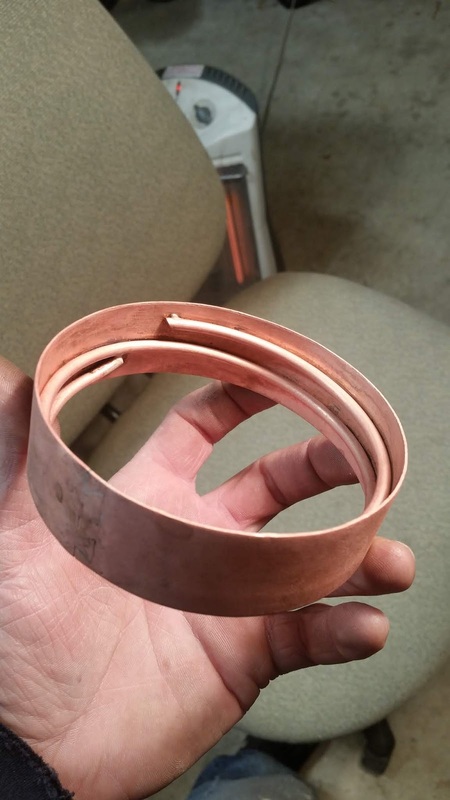 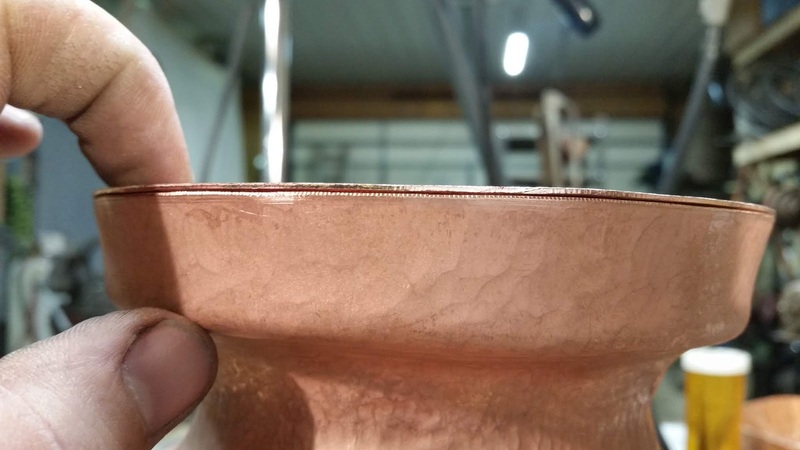 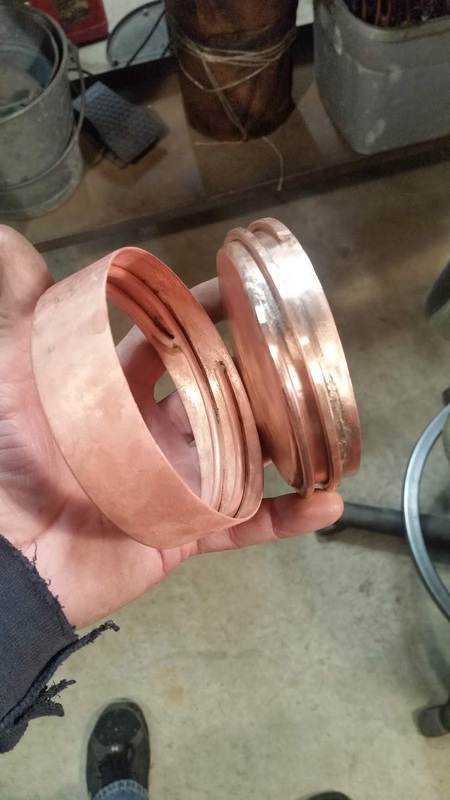 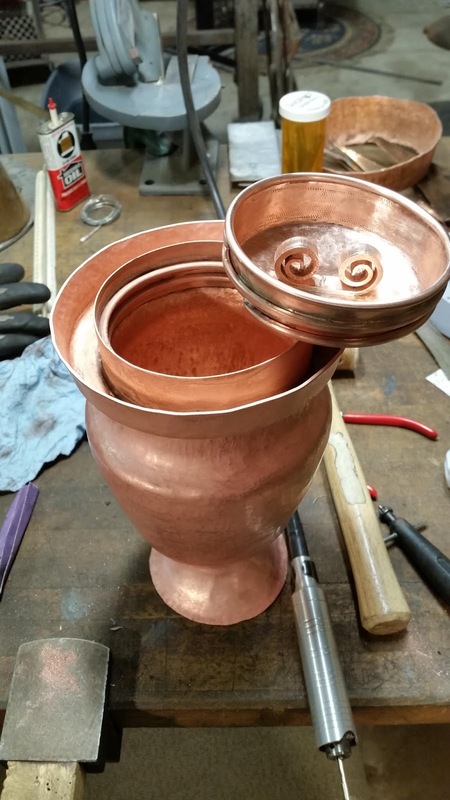 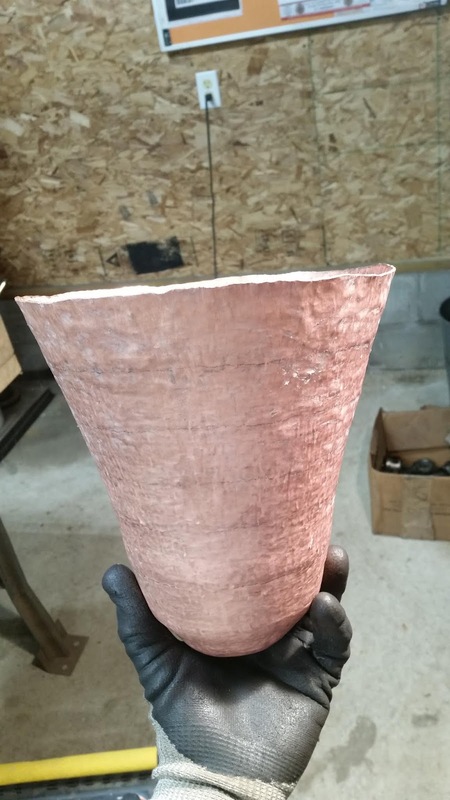 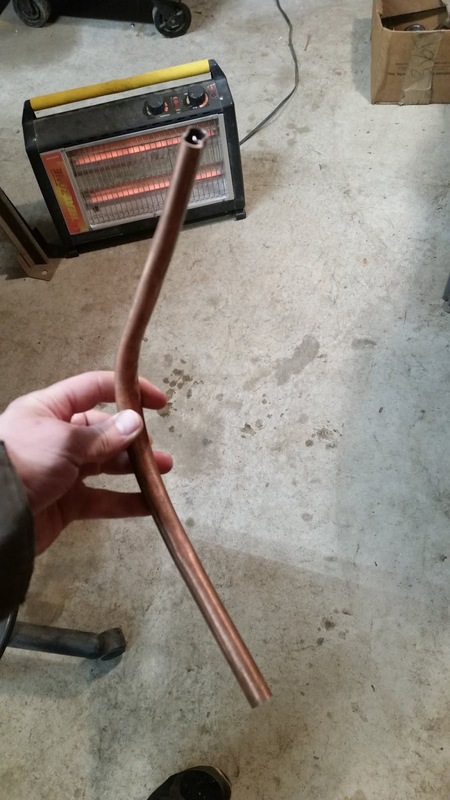 Most copper or brass you will find is in a hard state. 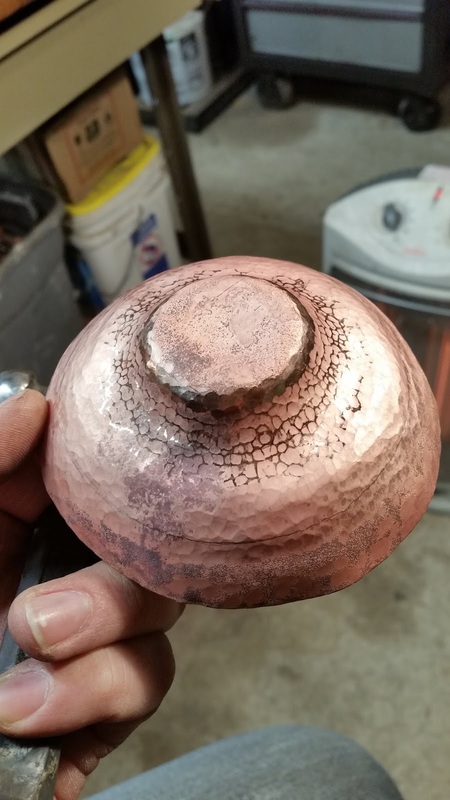 When metal is cold formed or forged the crystalline structure of the metal gets compressed and as working continues it becomes harder and more brittle; this is called work hardening and the metal needs to be softened in order to continue forging without causing the metal to break. 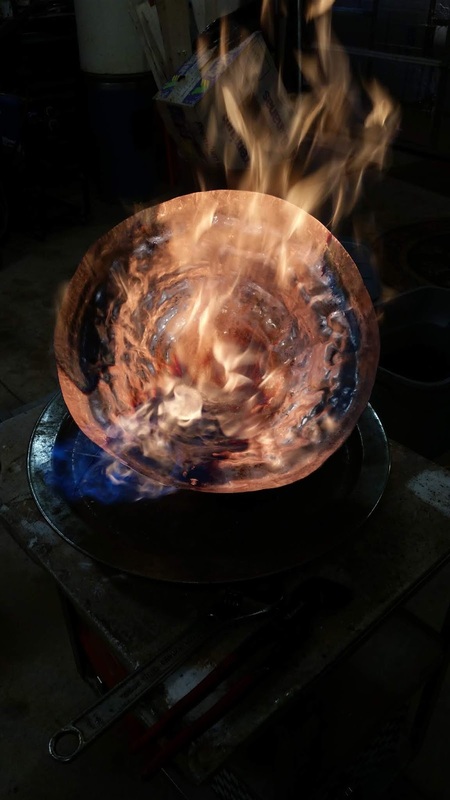 Annealing is the process of heating the metal to a hot enough temperature that the crystalline structure of the metal relaxes or expands. 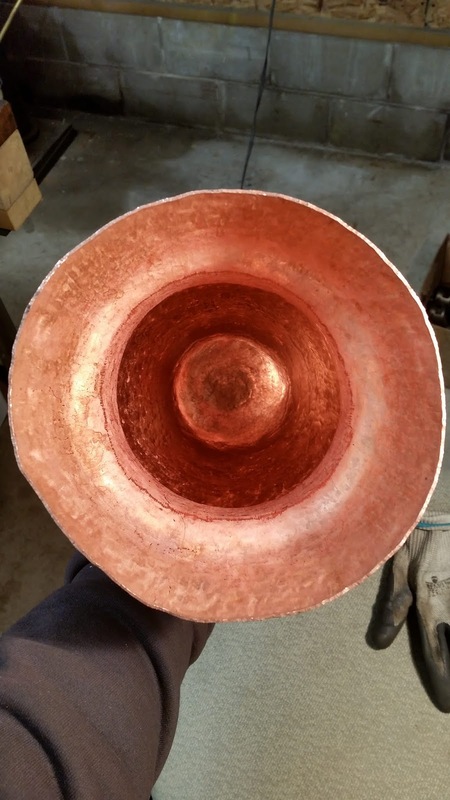 After the metal has been annealed, you may cool the metal and now that it is soft again, you may form the metal until it becomes hard again. 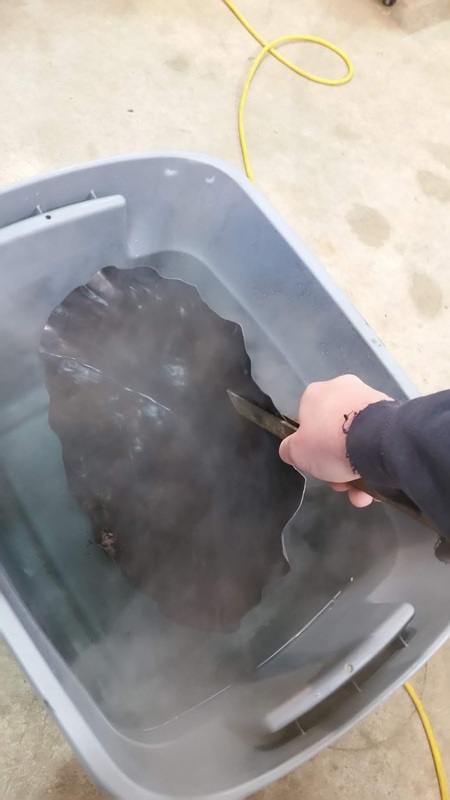 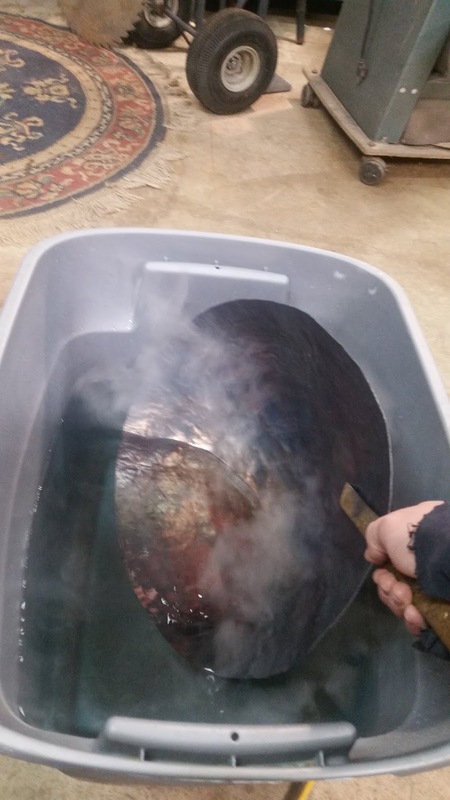 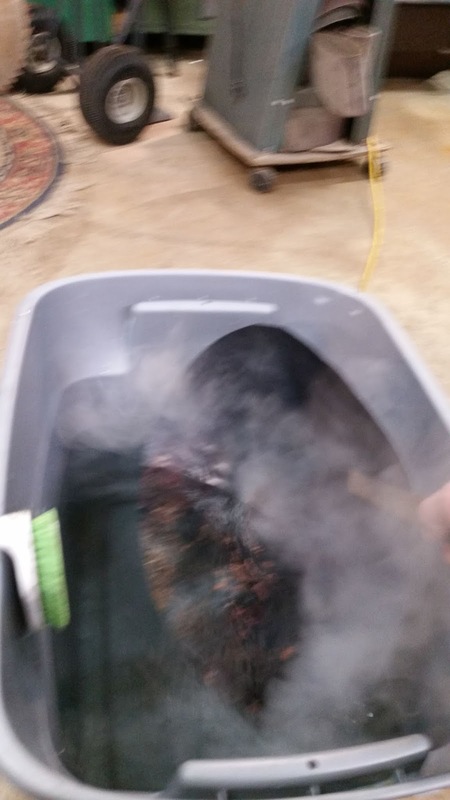 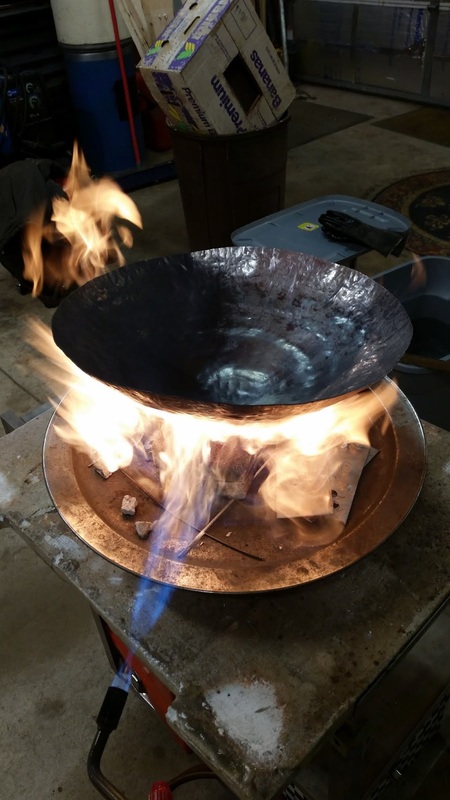 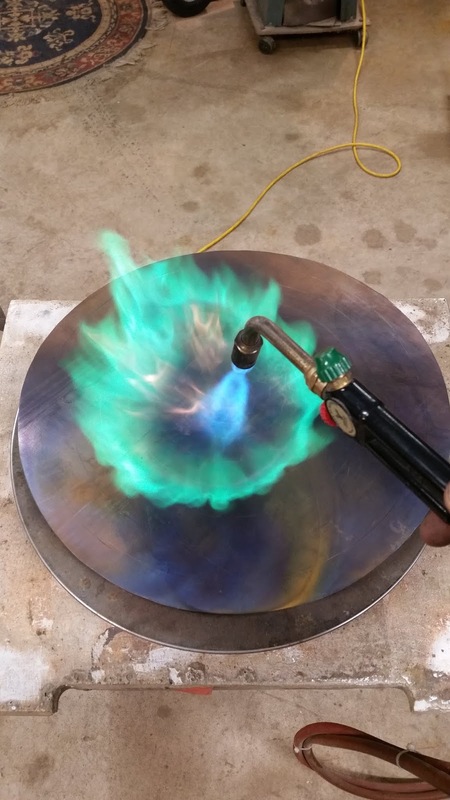 After I anneal the metal I clean it in a mild acid to remove the black firescale from the surface so that when I Forge the metal it does not get embedded in the surface and discolor the metal. 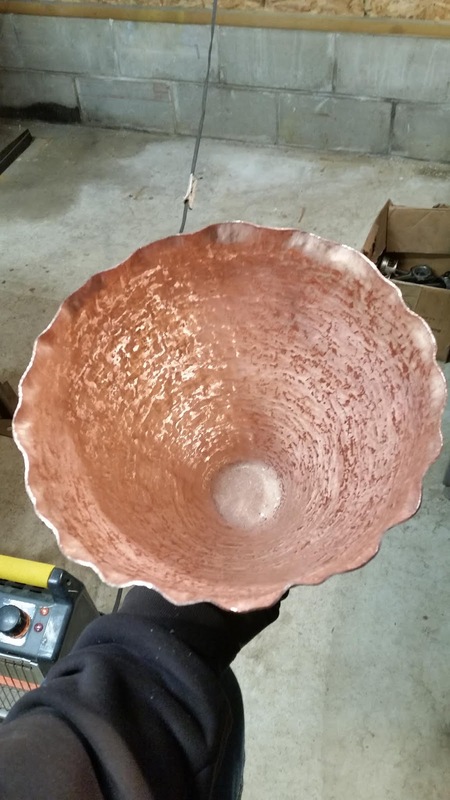 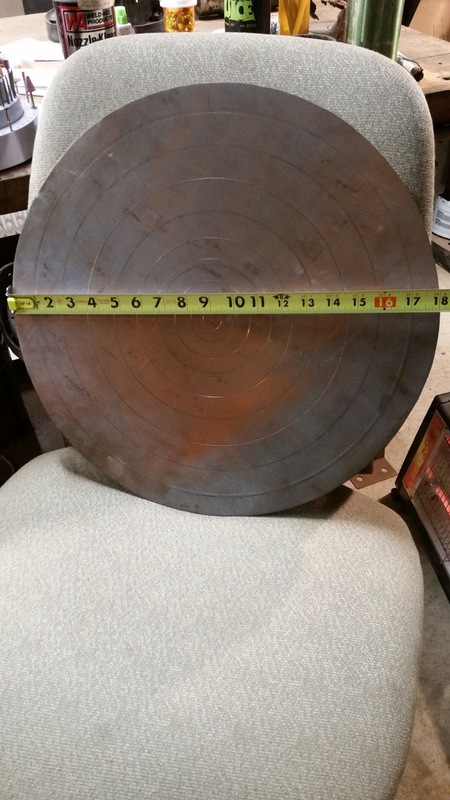 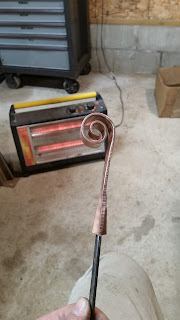 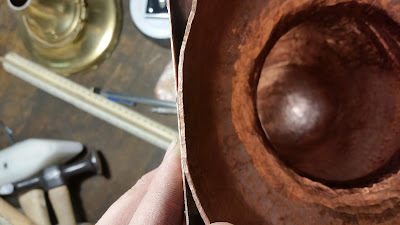 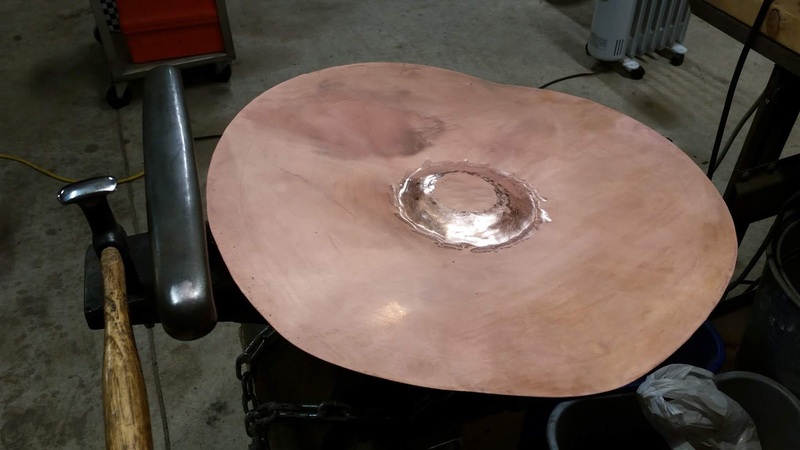 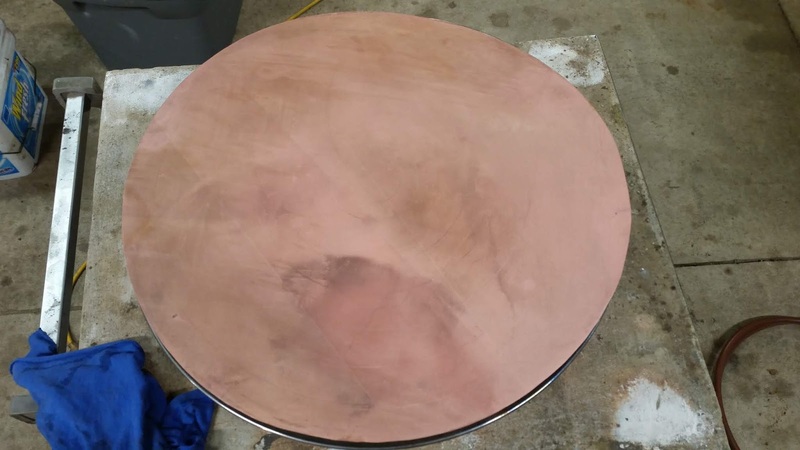 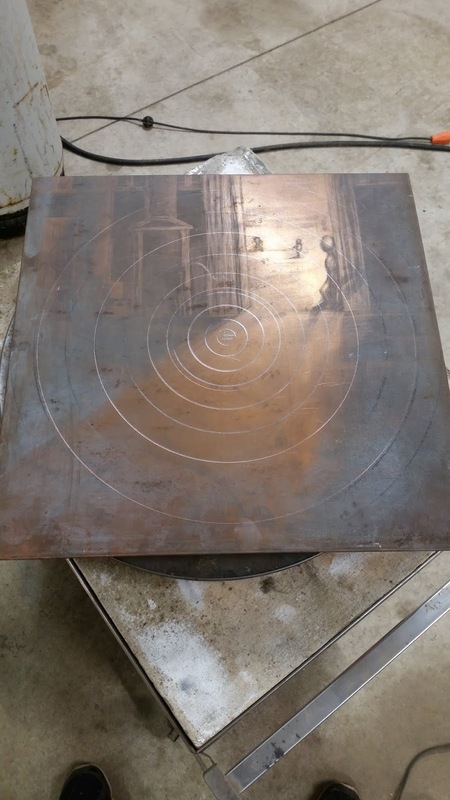 Now, with soft copper I begin hammering concentric circles from the center of the disc around and around until I reach the outer edge. 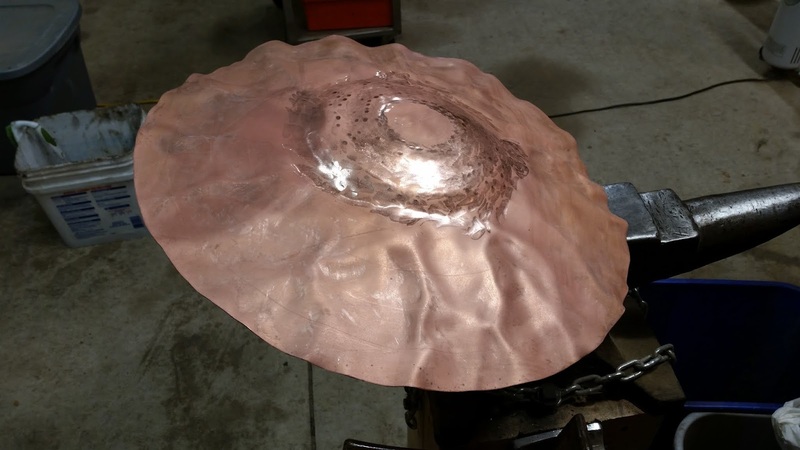 Due to the varying force and placement of the hammer blows, the metal is displaced like a ripple moving from the center outward. 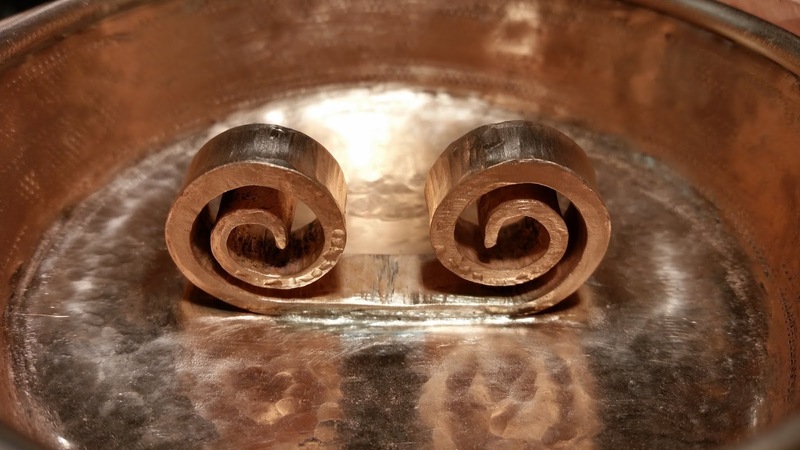 As the raising continues some of the inconsistencies get more and more pronounced and wrinkles develop. Before the wrinkles get to hardened or too deep, one must take time to hammer them down and planish (smooth) them out. 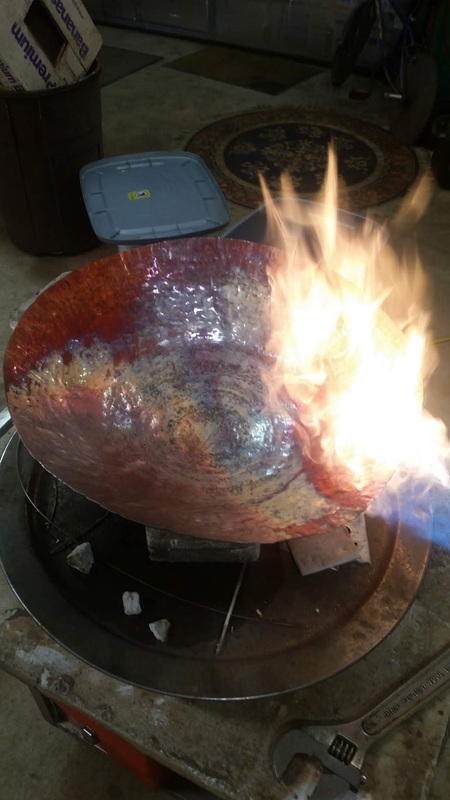 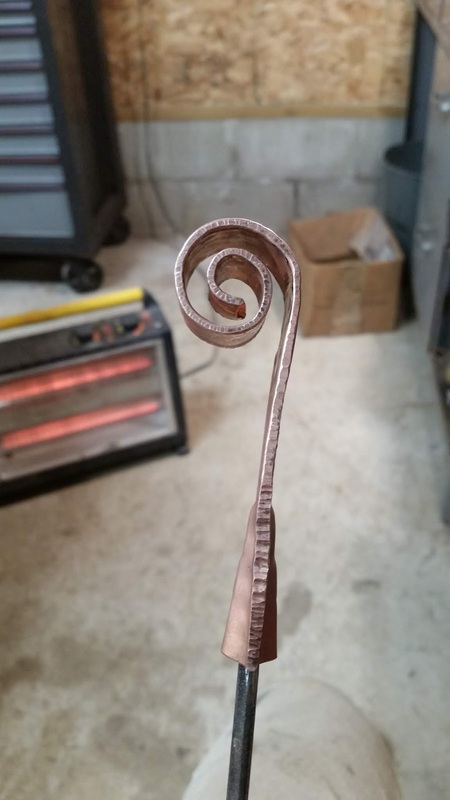 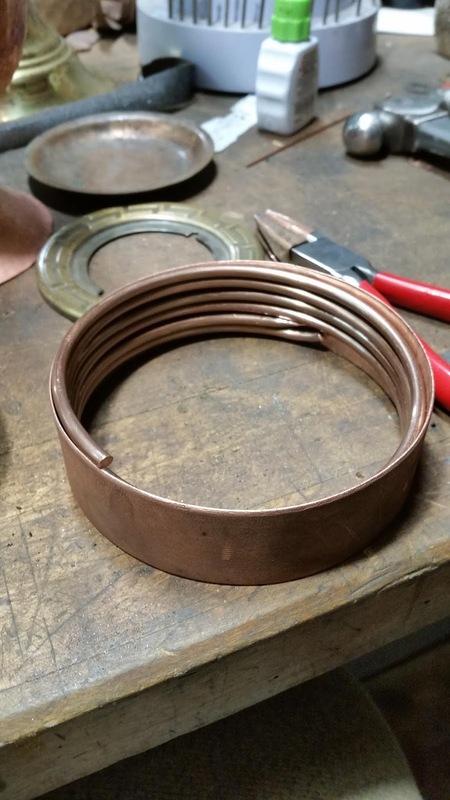 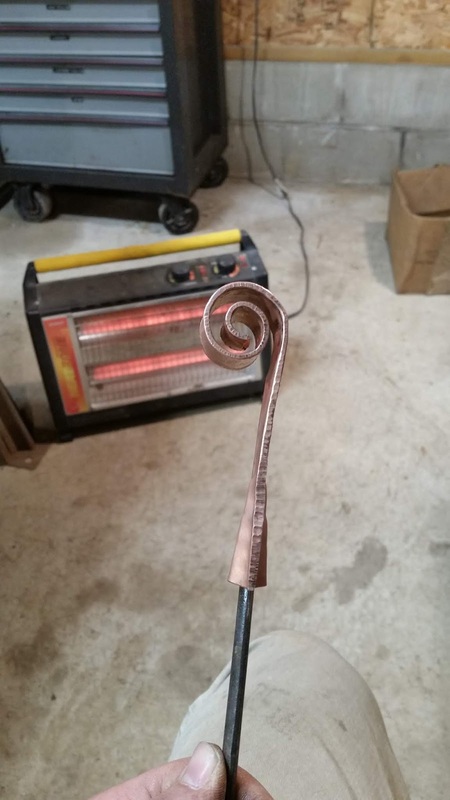 Throughout the entire raising process, annealing must be done every so often as well as taking the wrinkles out. 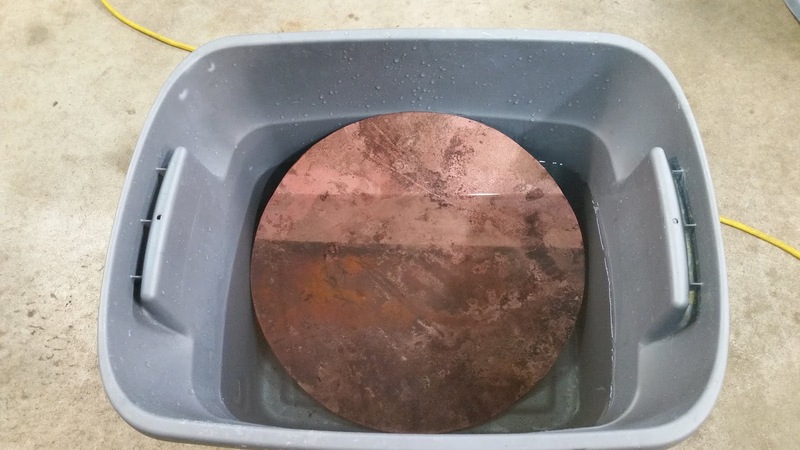 The metal must always be kept clean of fire scale and debris so that no unwanted particles are hammered into the surface of the metal. 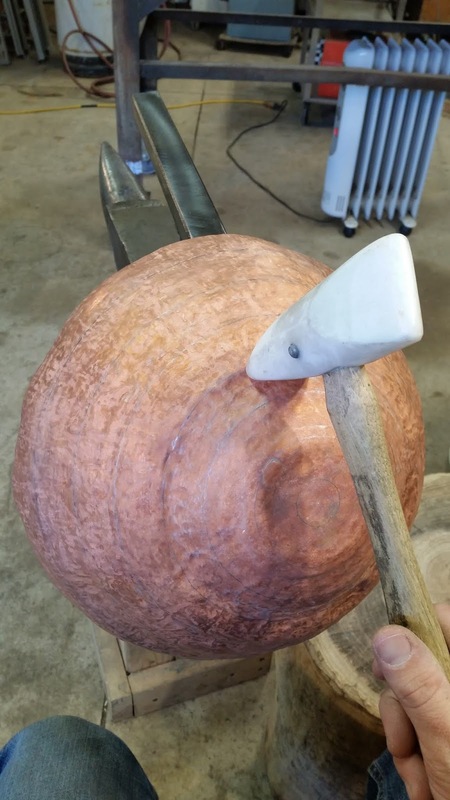 Wrinkles smoothed and piece work hardened again. 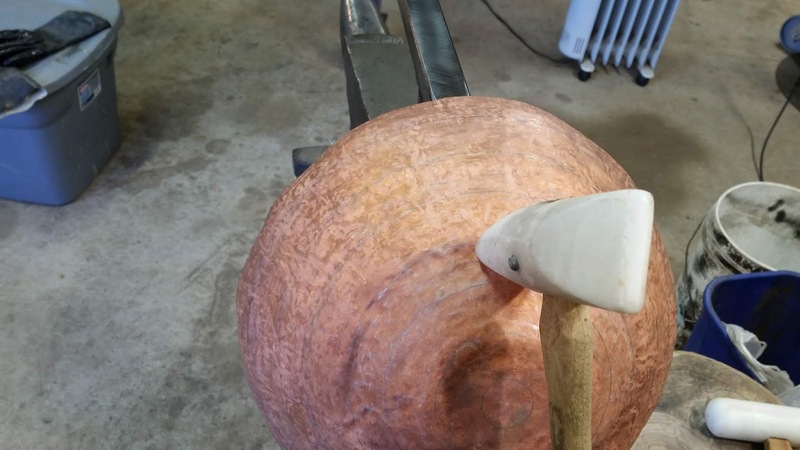 Several more rounds with a plastic hammer avoids adding too much texture and yet it's still work hardens the metal. 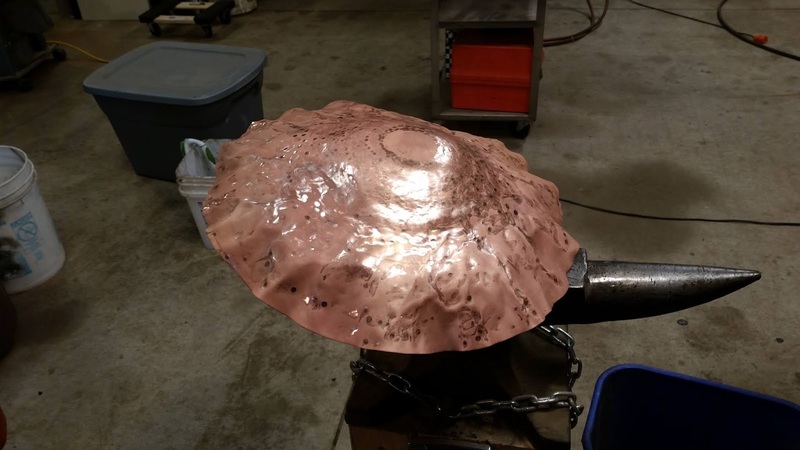 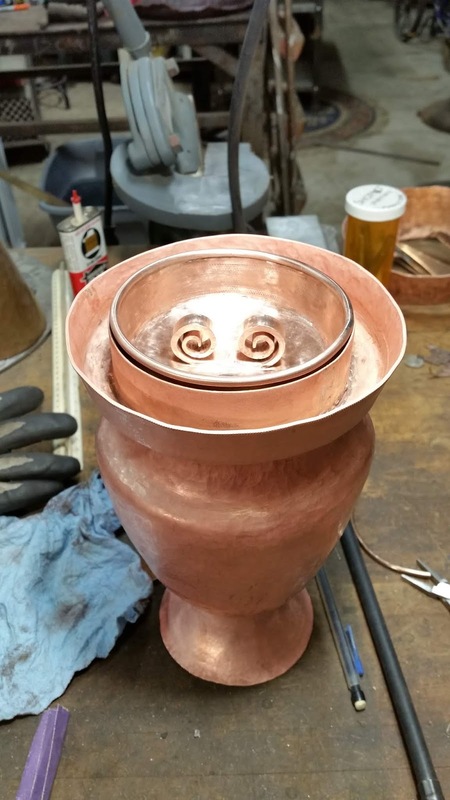 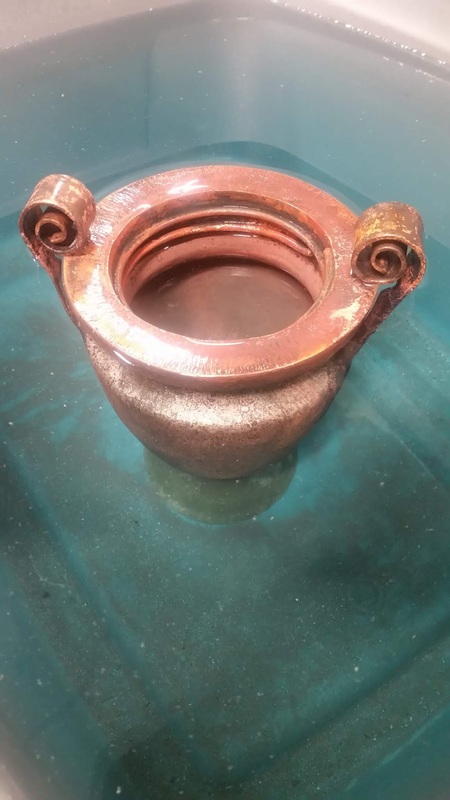 Typically only a couple concentric passes over the surface of the vessel being raised and it's most likely that the metal needs to be annealed and cleaned again. 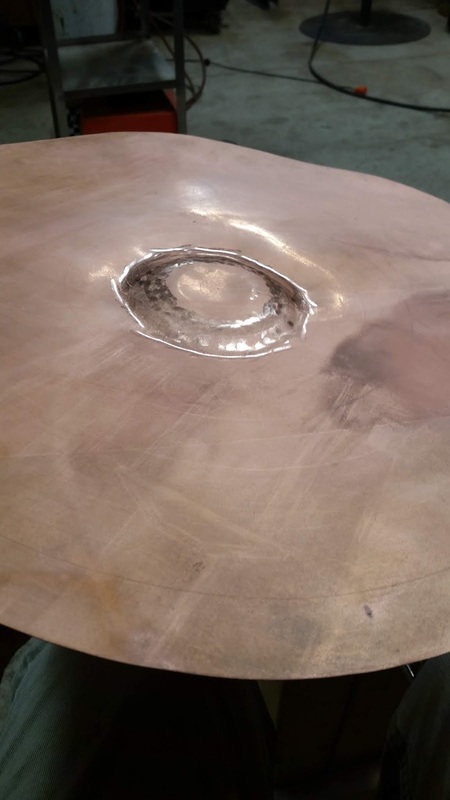 Working in circles from the center out the metal sheet is displaced in space just like a ripple on water and every time the Ripple gets to its lowest point it stays there and that is how the vessel grows into a voluminous form. 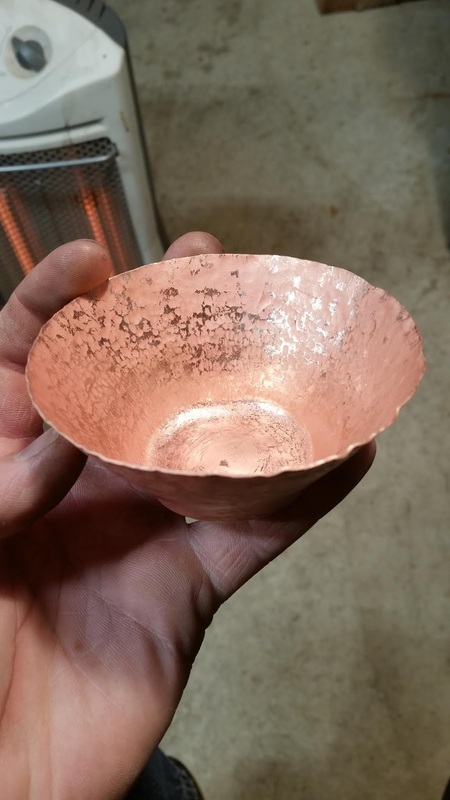 Metal vessels, such as pitchers, bowls that are made in this fashion are referred to as hollowware. 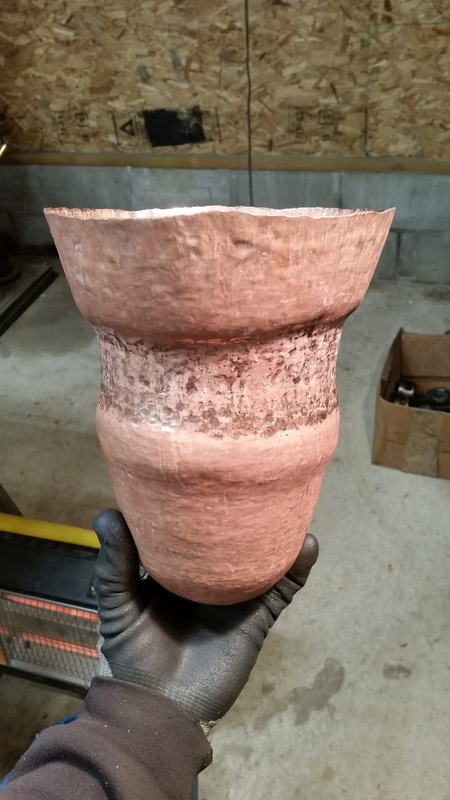 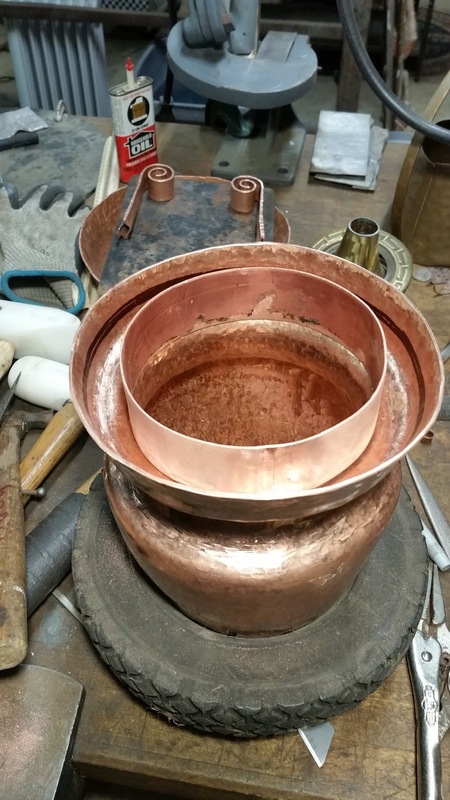 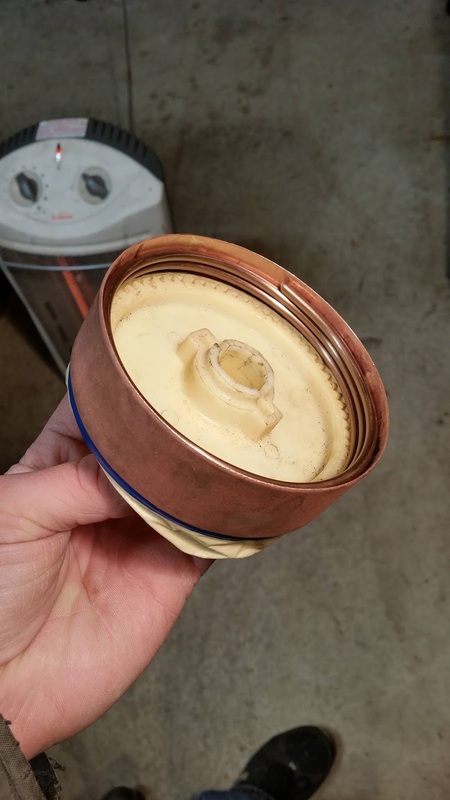 I usually take my vessels in a different direction by adding an inner bowl in order to make the vessel double-walled and appear to be more of a solid mass. 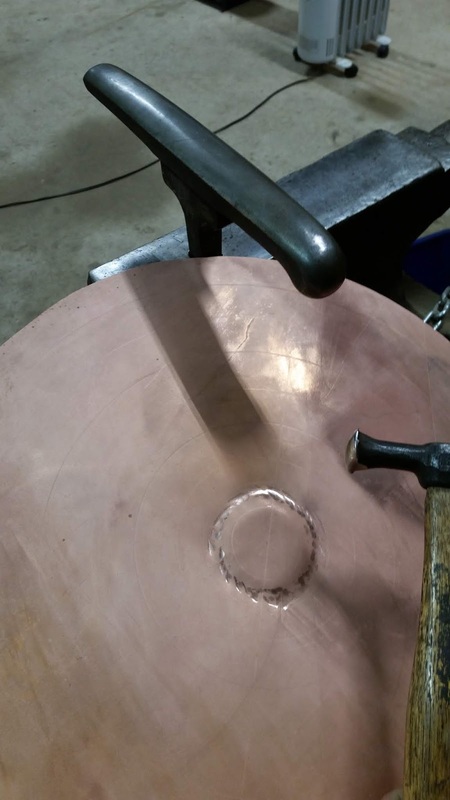 Rings are scribed or drawn to help raid the vessel symmetrically with balanced hammer blows. 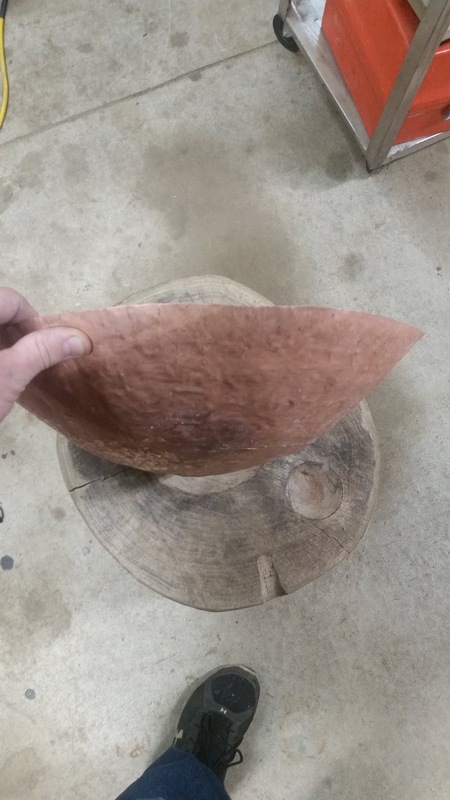 The most difficult part of this form is when the disc is raised into a cup with vertical signs and then those sides AR being hammered beyond vertical towards the center, thus forcing more material to compress into itself, causing the material to become thicker and harder to manipulate. 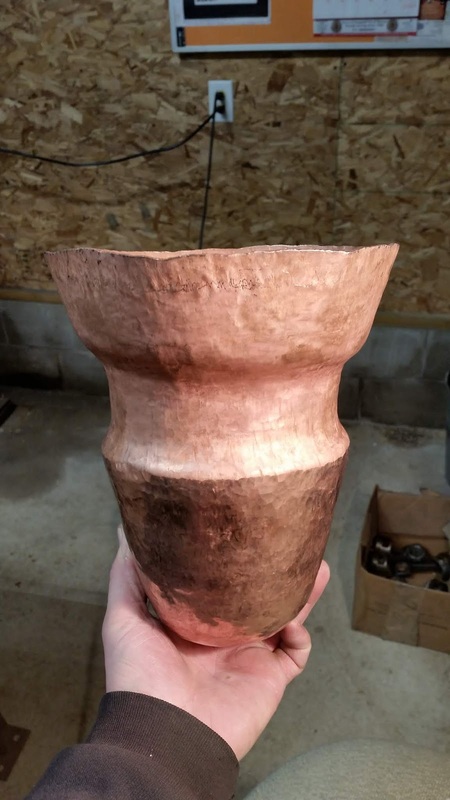 41 hours of hammering gets you this far. The metal is shiny because it has been burnished by the blows of the metal hammer and now it is in a work hardened state again. 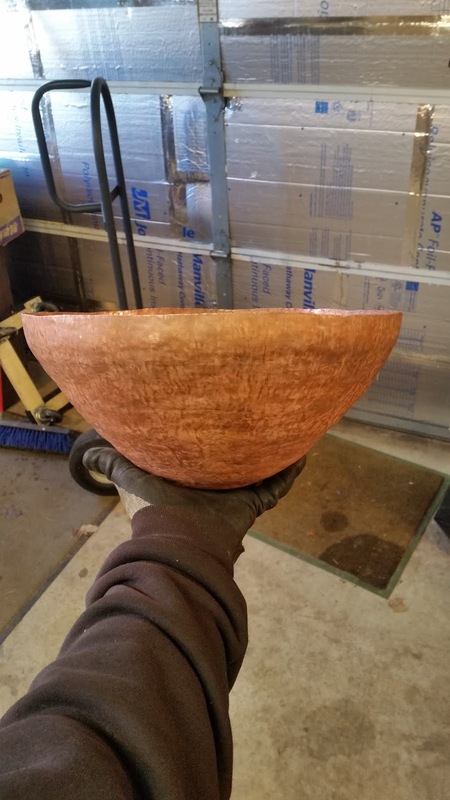 Coming together. 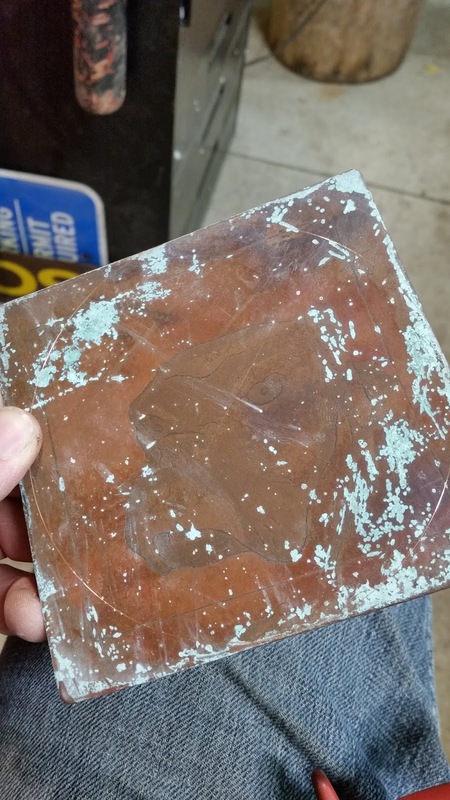 Several reclaimed pieces for potential incorporation and for reference. Funerary urn in the style of a Greek Krater. 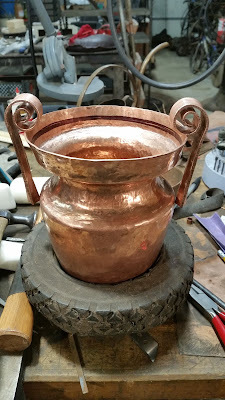 Awaiting more detailing, more hammered texture buying, cleaning and patina. 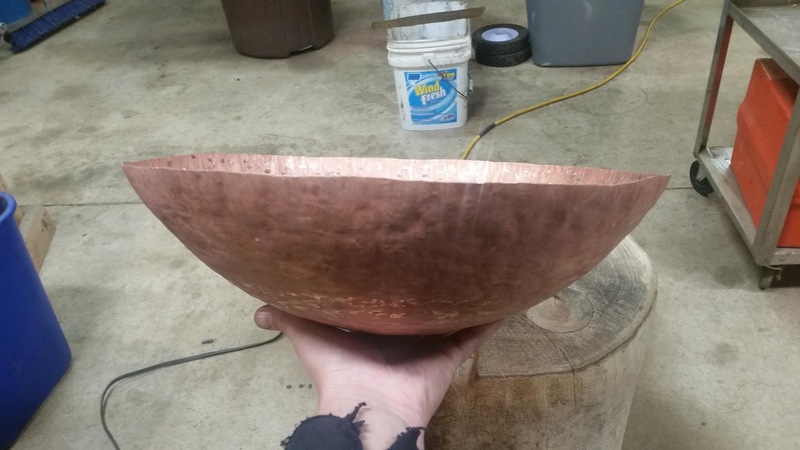 I fabricate sculptural objects and jewelry from reclaimed materials (most often copper or brass). 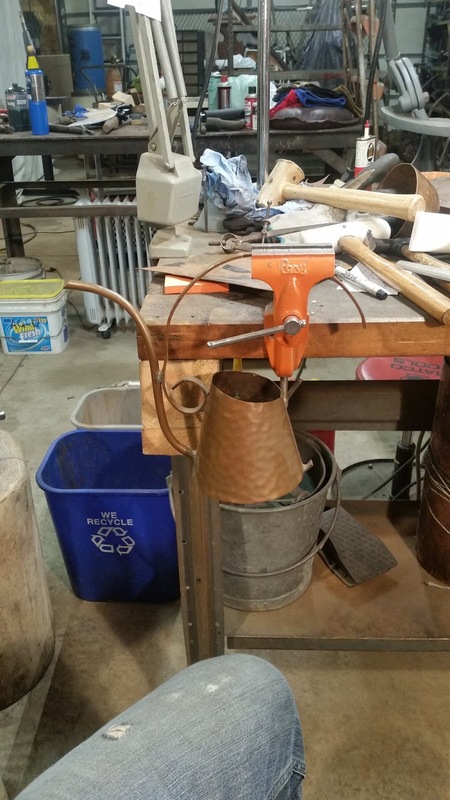 Works are also made using reclaimed, manipulated or modified tools, since I am a fan of recycling, up-cycling, re-purposing and the like. 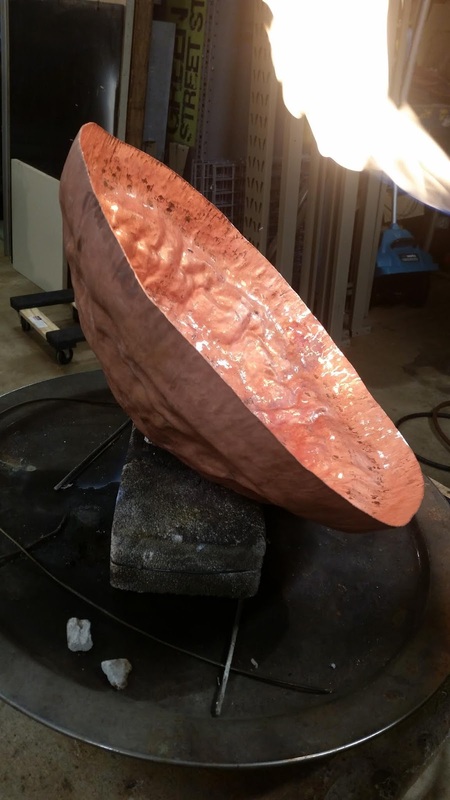 My work is lead by intuition and the struggle to find new ways to refine my methods of manipulating materials. 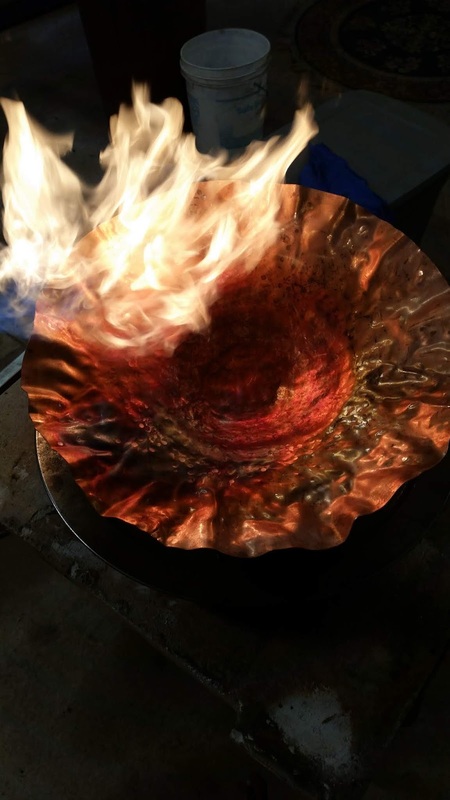 Actions versus reactions create pathways and reveal opportunities to learn more about what certain materials can or cannot do. 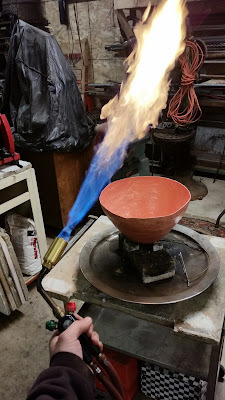 I switch gears from sculpture to jewelry and vice-versa to clear my head and also to explore new ideas. 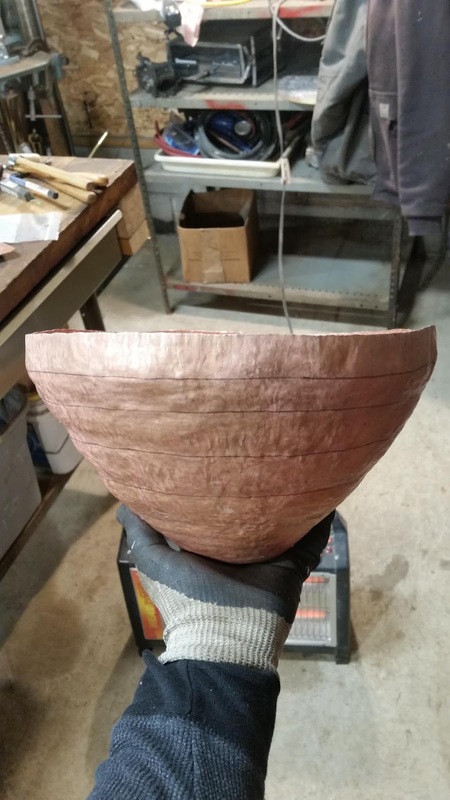 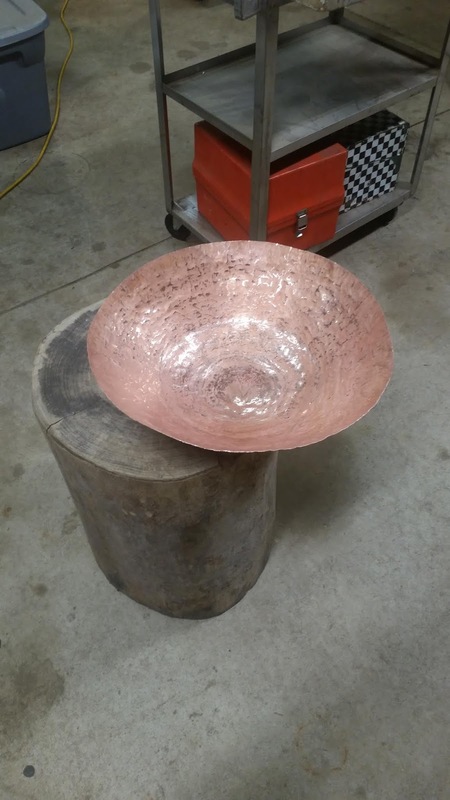 I am currently focused on sculptural vessels that satisfy my craving to be able to transform sheets of metal into more complex and aesthetically pleasing art forms that incorporate a sense of utility and an illusion of density. 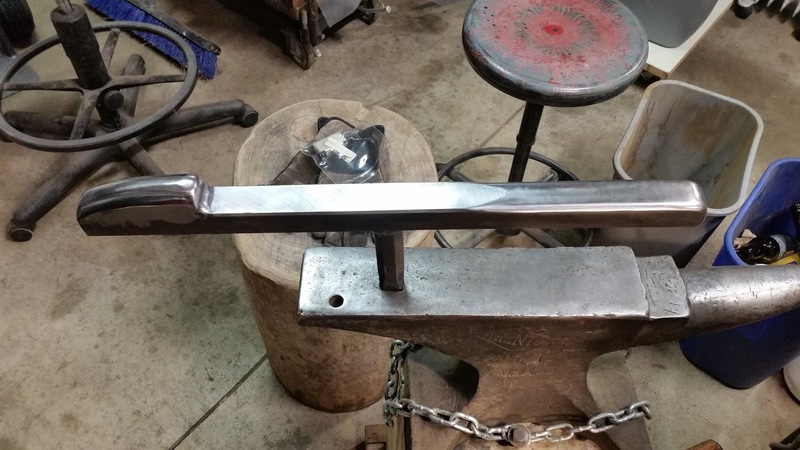 With each strike of the hammer, I alter the manner in which the metal exists in space. 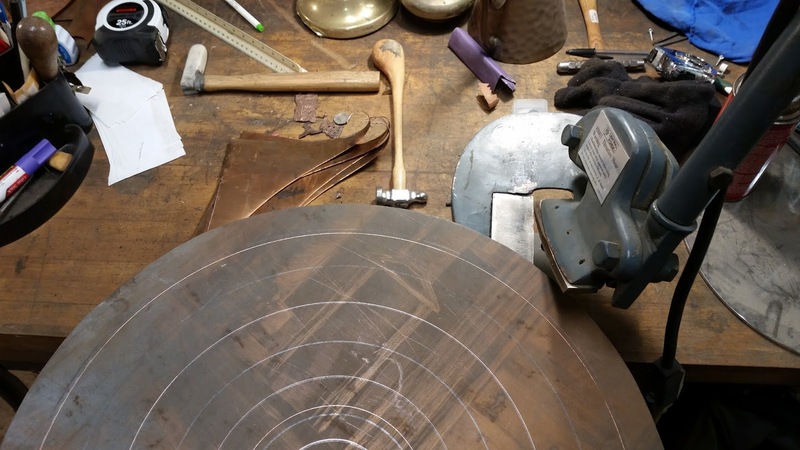 Each tool selected for use has a specific quality or feature that is required to transform the piece to my liking, to align the elements of shape, texture, color and space with the principles of balance, rhythm, variety and harmony.